But after many solo meals or with friends at Pure, this was only the third time I took my family there. And it was a feast for the ages. I will add a few dishes to the list below, but the one big takeaway is to pay special attention to the board and take advantage of the specials, especially the main course. This time it was Tiger Shrimp, glass noodles, mushrooms, bok choy, scallions dressed with a light sesame garlic soy. Most mains as such come with white rice covered completely by fried omelette. Worth going just for the specials. 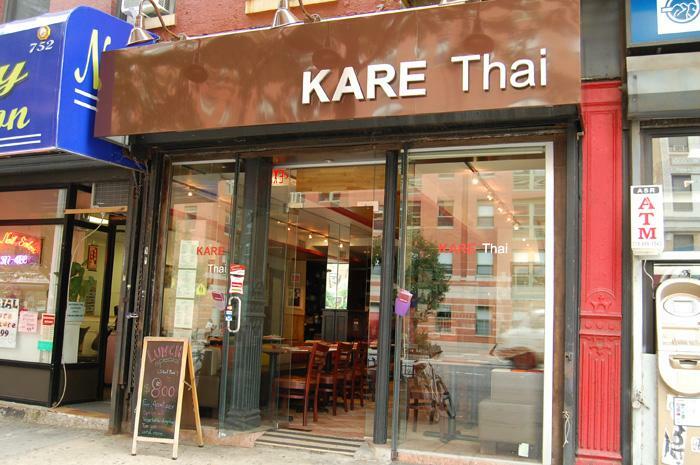 I started this blog in 2012, about 2 years after Pure Thai Shophouse opened on 9th ave. Yes, it was called Shophouse back then, until two lawyers from Chipotle walked inside demanding a name change. Little Pure Thai was apparently a threat to Chipotle’s brand spanking new Asian Kitchen Shophouse brand. And what do you know, the threat was apparently real. Long time readers of this blog know the story. The initial idea was to create a sense of a Thai street Shophouse-like environment inside. The place is after-all “if you sneeze you may miss it” tiny, cramped, slightly uncomfortable, and sometimes even smells a little. My type of place. But if not your type, this post may help. What to order: The reason for this post…. 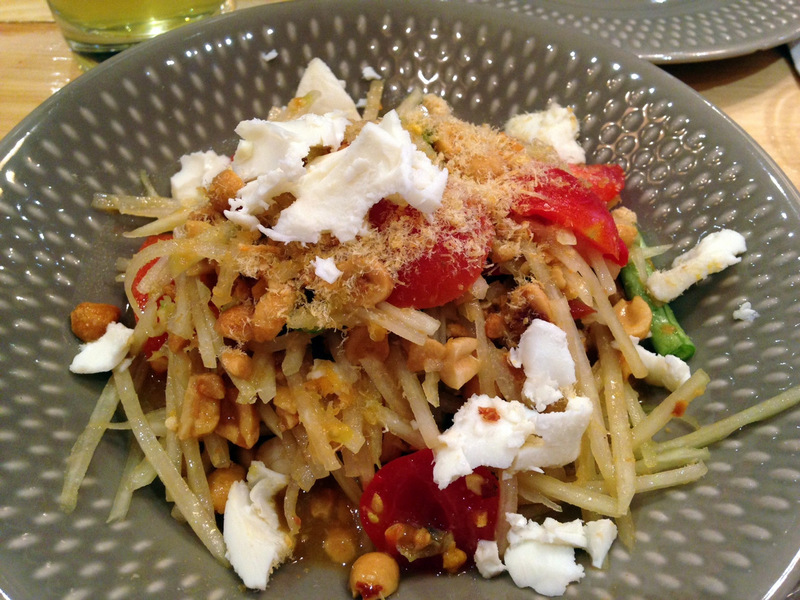 Green Papaya Salad – This is a classic Thai dish that you can get everywhere including all over 9th ave. 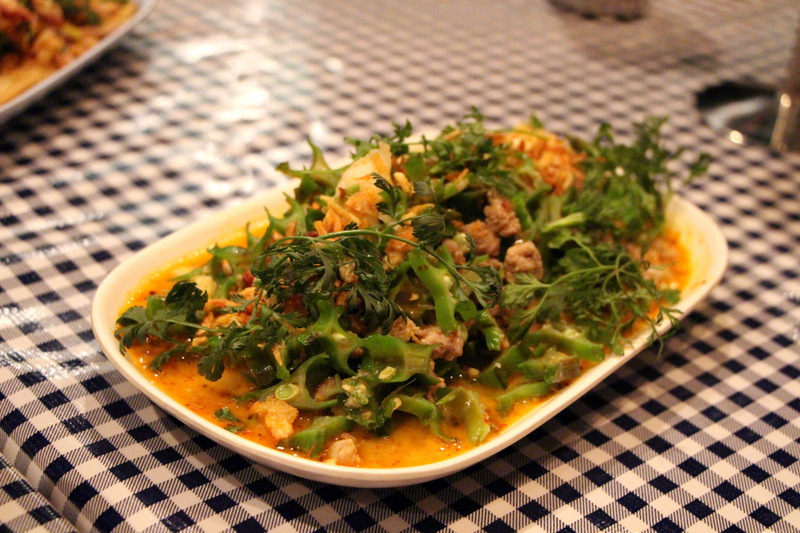 But Pure’s version is… well, pure, loaded with addictive heat and dried shrimp. 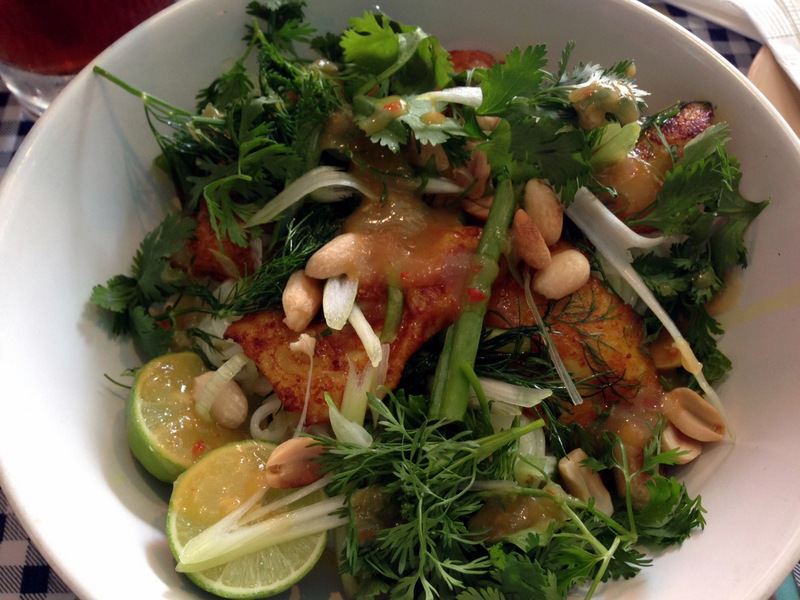 If you never had a Papaya Salad before, you came to the right place. Jungle Curry Fried Rice With Chicken – Some of the best simple looking fried rice dishes you’ll find in the city. Fragrant, and spicy (notice a trend? It ends soon). Serves as a great side dish or main. 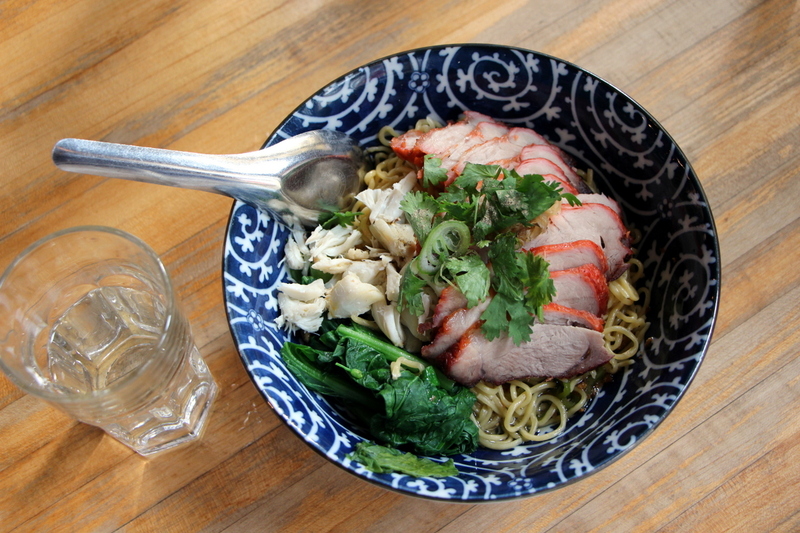 Ratchaburi Crab & Pork Dry Noodles – This is the Oprah Winfrey of the Pure dishes. A dish liked by everyone. 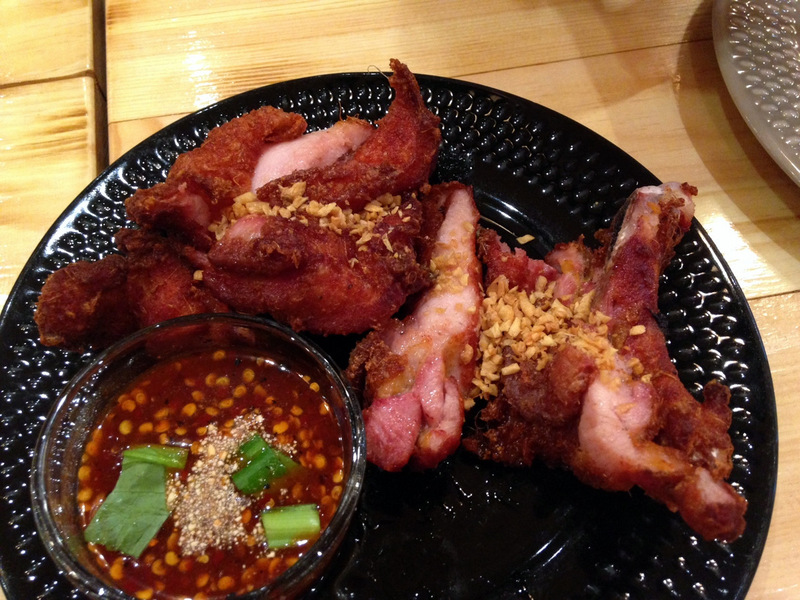 A specialty of Ratchaburi region, where one of the owners (wife) hails from. 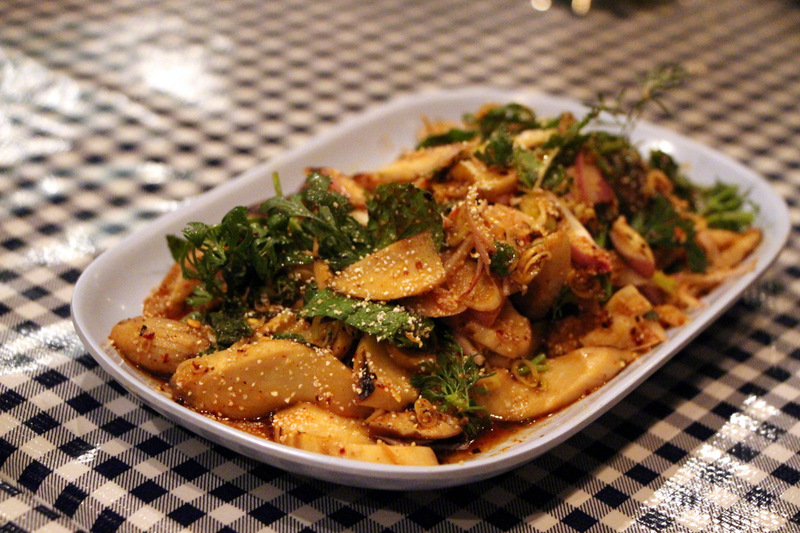 Its very mild and so a safe dish for the heat challenged, but satisfying enough for those seeking bolder flavors. Scoop up the broth to the top and mix this baby well. 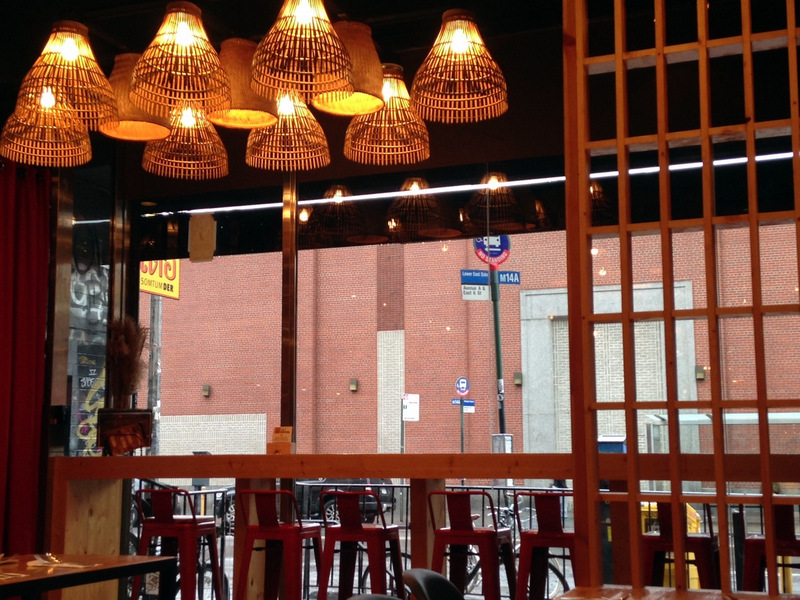 Sukhothai Pork Noodles Soup – One of my favorite soups in Hell’s Kitchen. It got the depth, the aroma and all kinds of pork action. 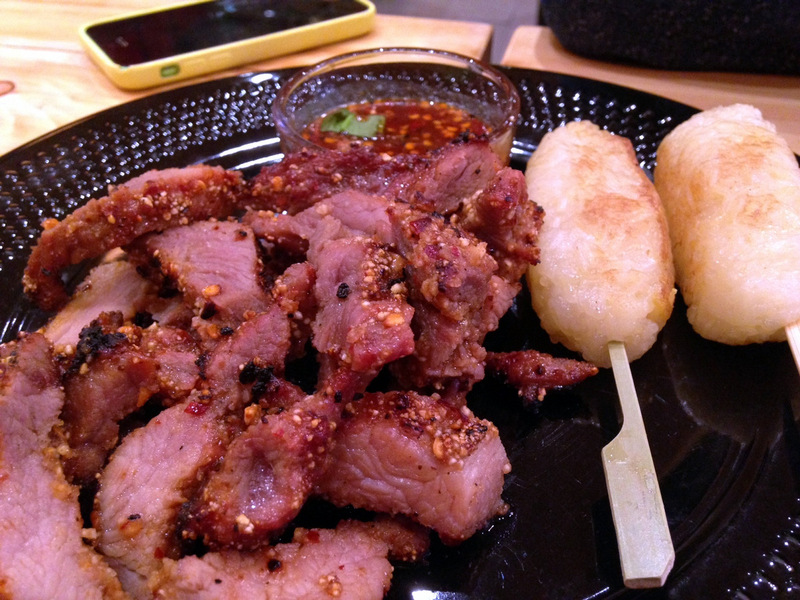 Three different textures of pork in fact including craklings. 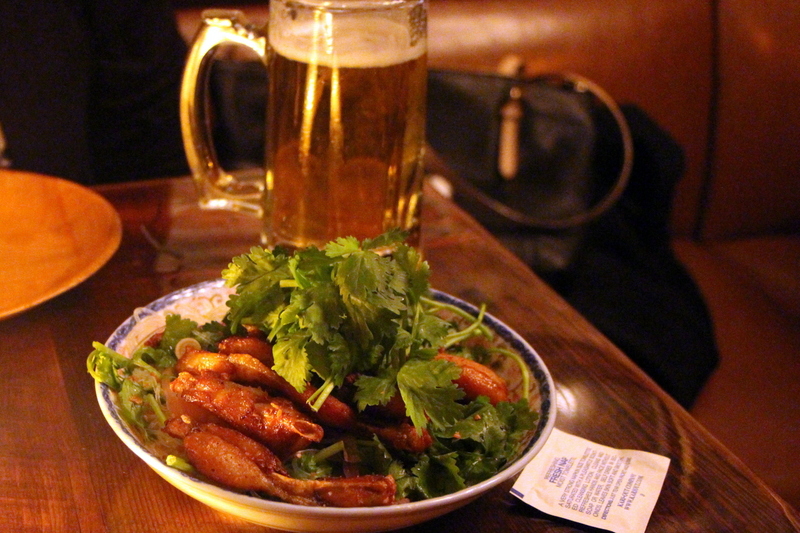 Special – When you come in, treasure awaits on the board in the back. The mains are more exciting. 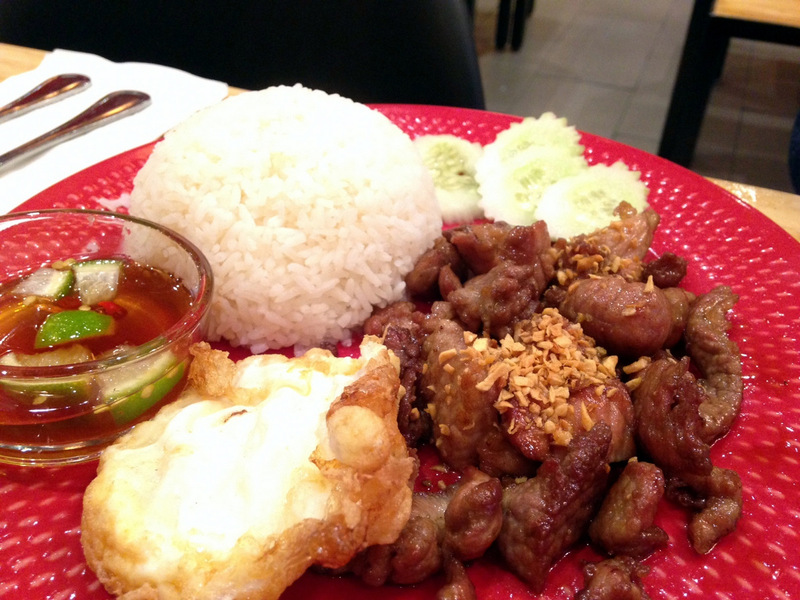 Often beef or shrimp sauteed with some kind of spicy paste, market fresh veggies, Jasmine rice, and a fried egg. And as I mentioned before, if its curry, it instantly becomes the best curry on 9th. Mango or Pumpkin Sticky Rice – Possibly the most important tip here since you can easily miss it. 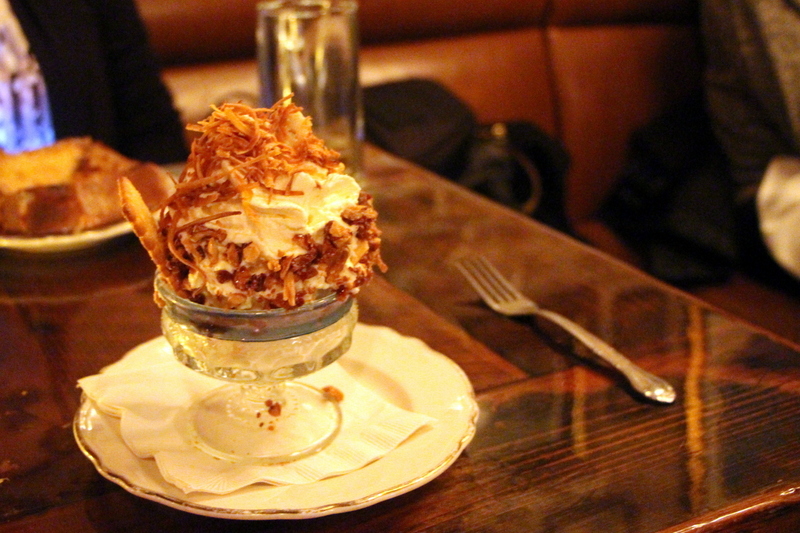 Its the lone dessert, always on the board as a special but sometimes they get too lazy and dont even list it. Sometimes its Mango, sometimes Pumpkin and sometimes both. 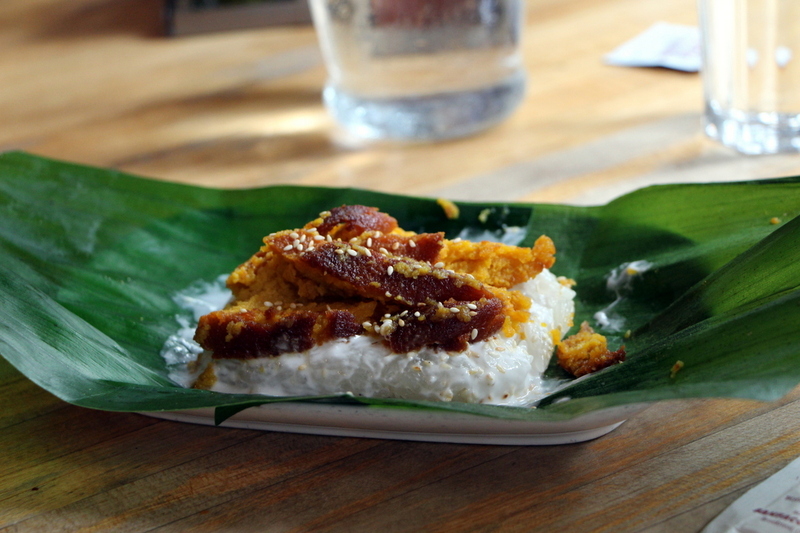 Served on top of sticky rice, with sesame and coconut milk wrapped in banana leaf. 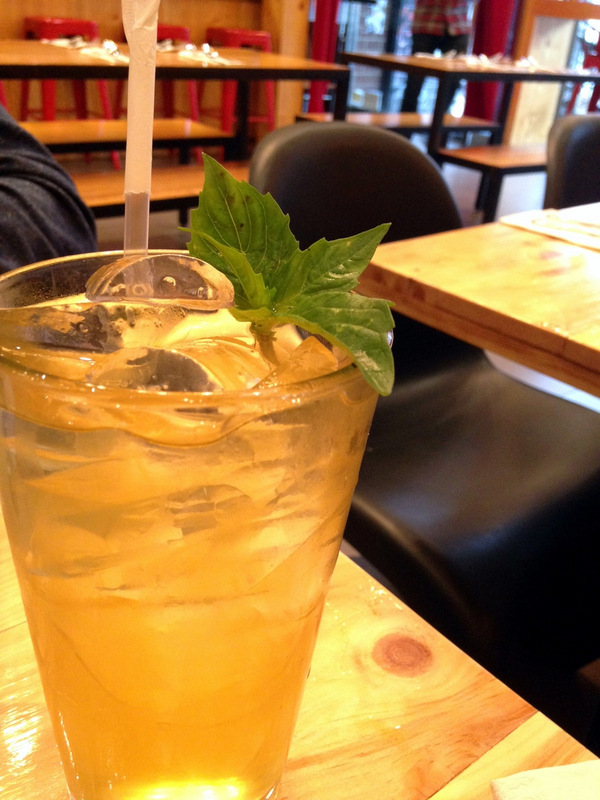 Its warm, with just enough sweetness, and simply heavenly. Its a tale of two Thais. 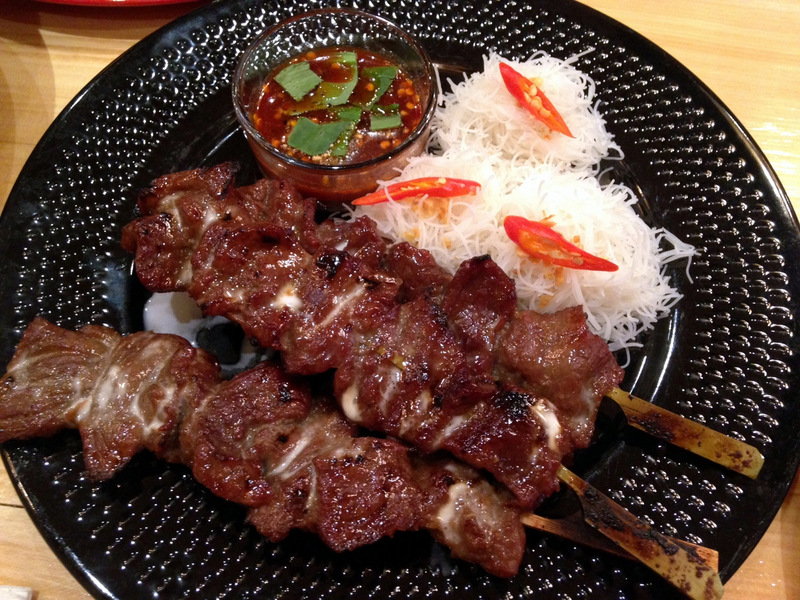 Pure Thai Cookhouse, a jam packed frat party at pretty much any time of the day, sometimes even just outside. Pam Real Thai, eerily quiet even at peak times sometimes. Pure has a limited, concentrated menu for Thai standards, while Pam has a megillah that includes all the color of the rainbow curries and other American Thai. Pure is where I bring visitors to experience the vibe and some regional specialties you wont find anywhere else, while Pam is terribly unattractive and uninviting. So why do I keep going to Pam Real Thai. Well, for starters, for some of the same reasons mentioned above. I dont want to wrestle tourists and locals for a table. As local as Pure is, the number of tourists that go there nowadays increased dramatically. I usually dont have much of a problem if I go solo as I can often get a seat on the counter facing the wall, but that means I get a seat by the counter facing the wall! At Pam not only I get a full table, but I sometimes get an entire section all too myself. I can spread my legs in all directions including Sharon Stone style and no one will bat an eye. I can listen to a conversation from across the room (95% theater industry related. Boy do they like to curse). I can hear a lung collapse and call 911 before its too late. At Pure I get to listen to Mandarin or French by the folks sitting pretty much on my lap, while the rest is white noise mixed in with the bizarre but catchy Thai disco. And then there’s the food. Pam Real’s food can be, well.. unreal sometimes. 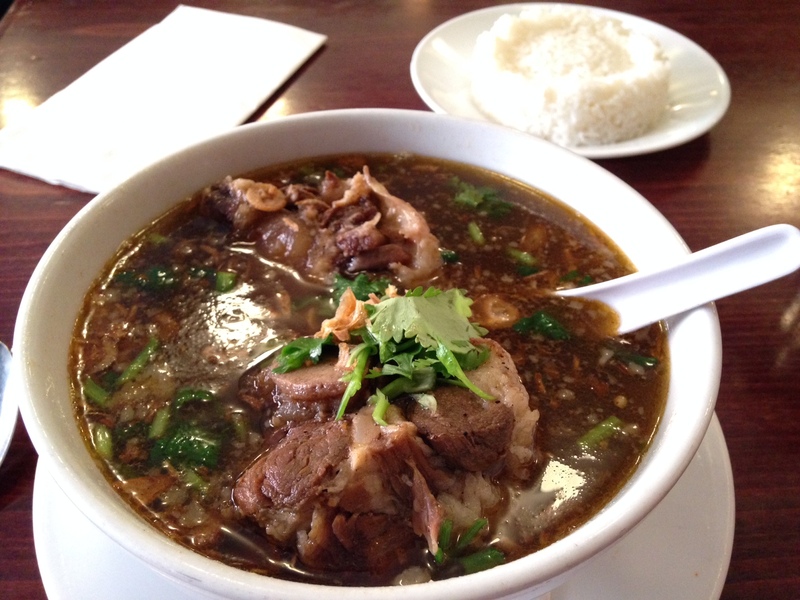 I’ve written much about its Oxtail soup, which inspired me to finally bring my wife and kids for a meal the other day. That pleasant vinegary heat, and all those chunks of Oxtail which increased over the years means you gotta work it, and may even sweat a little. But its just so damn good. 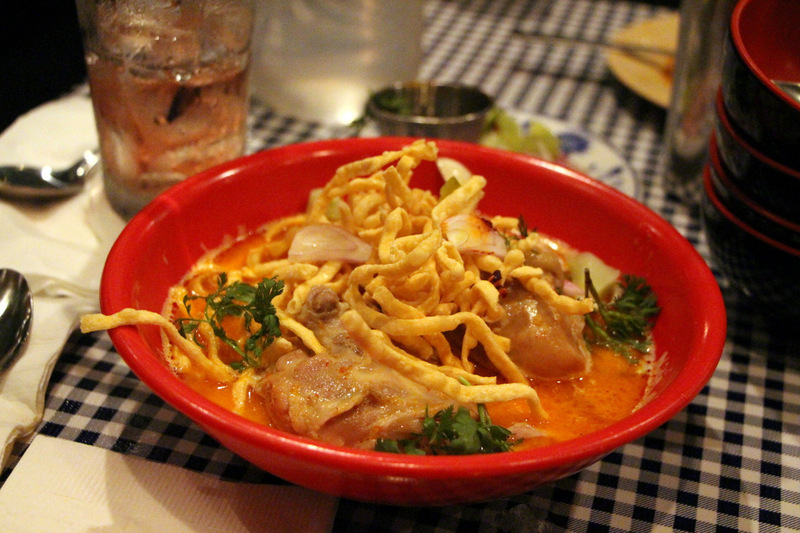 Same goes for their outrageous Khao Soi, a Northern Thai curry-like noodle soup packed with chili oil and topped with deep-fried crispy egg noodles. On a cold winter day especially, the soups work like magic, while in the summer they can cure summertime sadness (worth repeating because its true). I wish I could keep score of the goodies and badies (food blogger lingo) I’ve had here over the years. The big complaint from me is that its a very full menu. Steamed Thai Dumplings here can be as good as cheap Thai dumplings or Shumai can get. 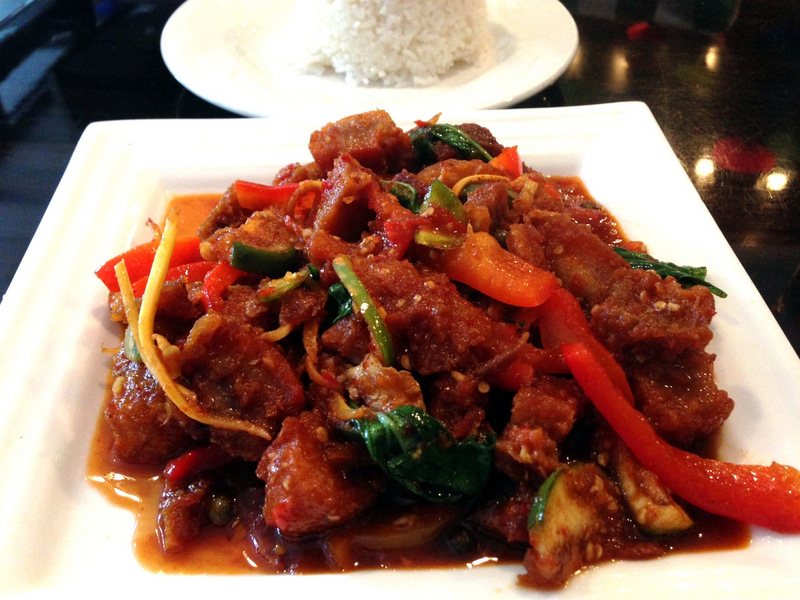 Pad Ped (red curry paste, bamboo shoot, basil, and bell pepper) with your choice of meat or seafood is always solid. 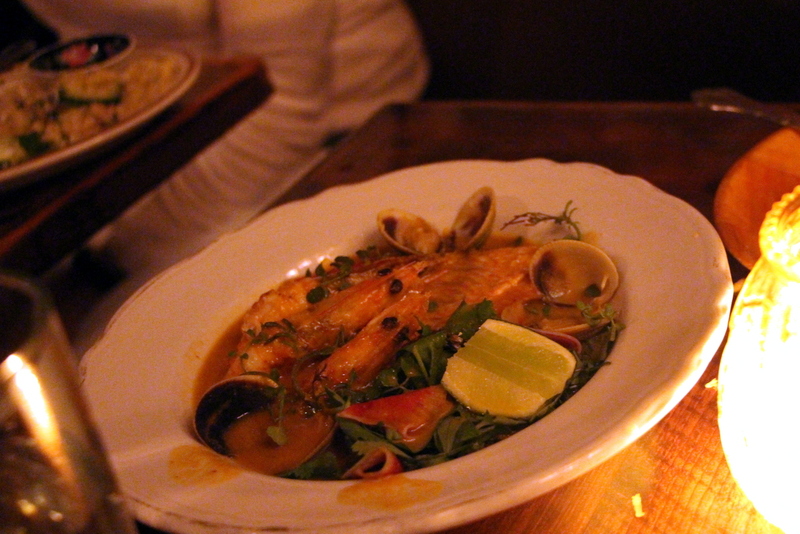 I go for the seafood mix (shrimp and squid) when I feel particularly naughty. 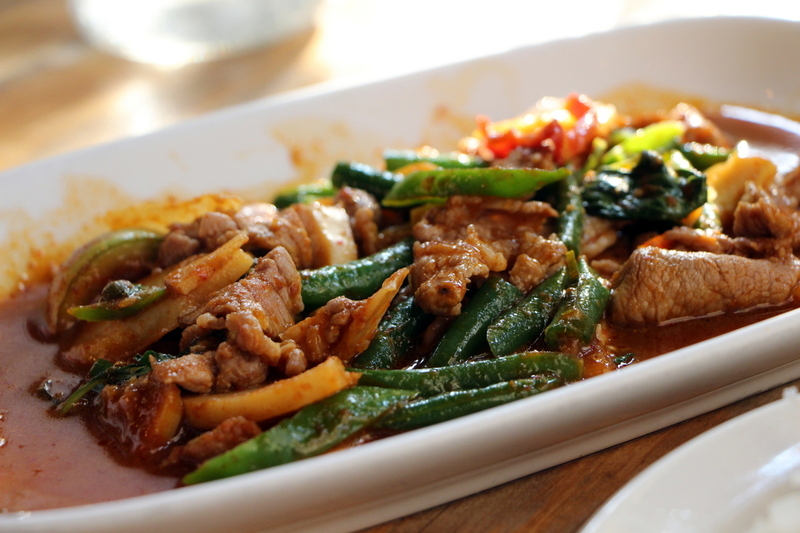 Same goes for the rest of the sauteed lineup like Crispy Pork With Basil, Pad Prik Khing (curry paste, long bean and lime leaves). For the most part these guys are not shy with their spices. There used to be a time when my go-to Thai dish was Pad Kee Mao (drunken noodles) everywhere and Pam’s seafood Kee Mao was head and shoulders above everyone else in this Thai rich hood. 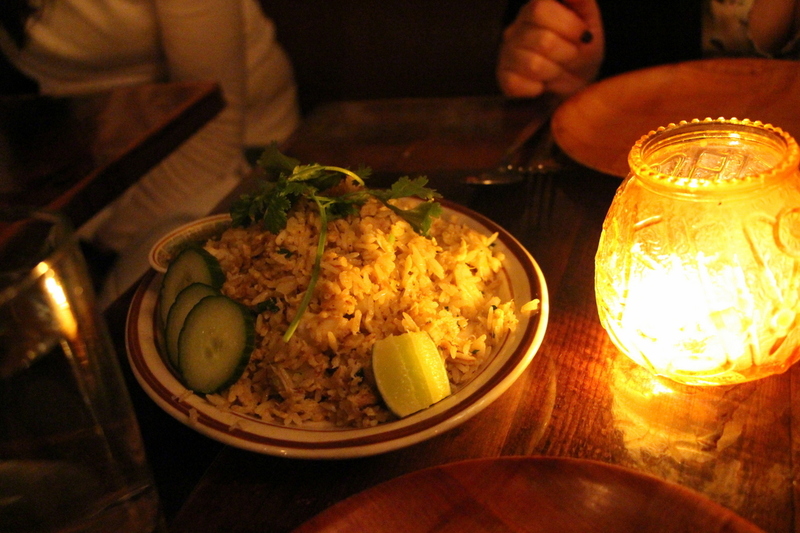 The generously crabby and excellent crab fried rice is another must get when you are sharing. 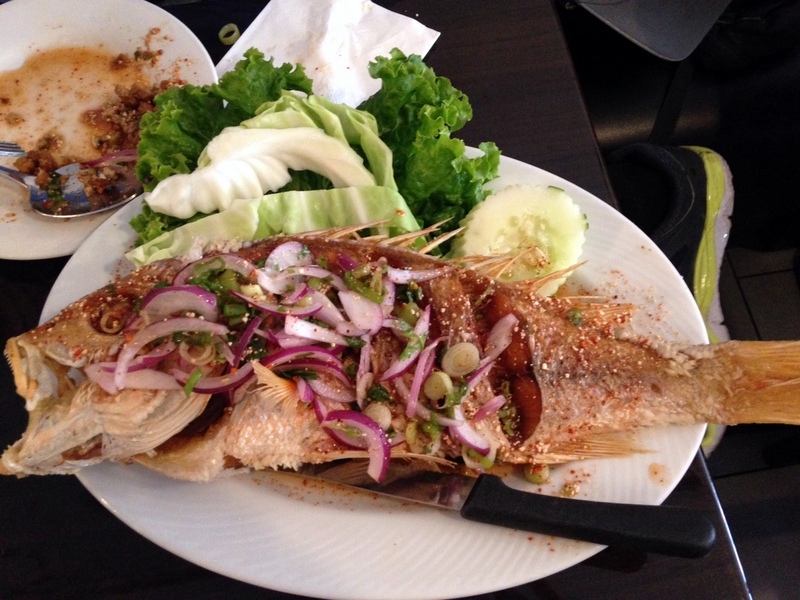 Crispy fried whole fish is one of those things I rarely order at Thai restaurants because its usually almost purposely overcooked, albeit liberally spiced and herbed. 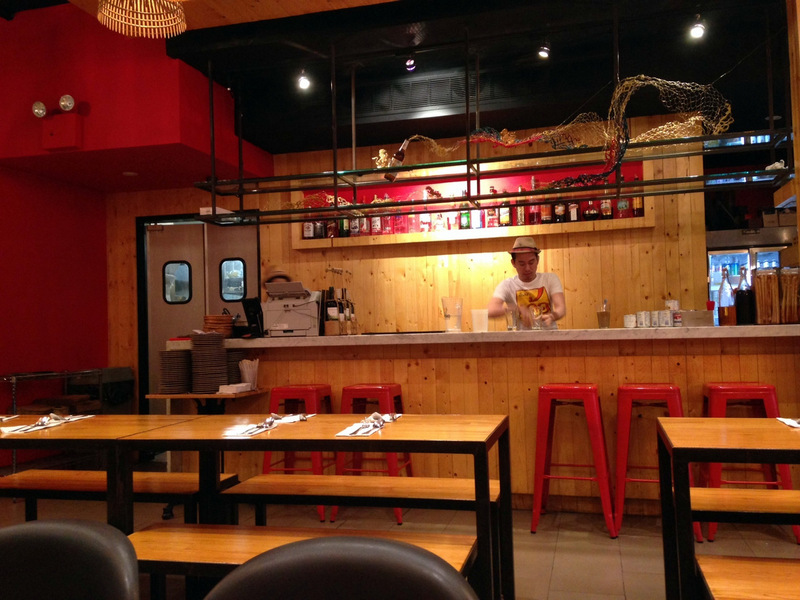 Here you can have your Red Snapper or another fresh fish a number of ways. I dont recall the name we tried, but it was smothered with a mild sweetish chili sauce, almost like a mild red Yemeni S’chug. While we enjoyed it I dont know if I would spend another $28 on it again. The irony here is that I prefer “Thai Style Fish” at menus in non Thai restaurants, like Cull and Pistol. Pam Real is a solid go. Dont worry about looks and reviews (very full menu + delivery = reviews all over the place). 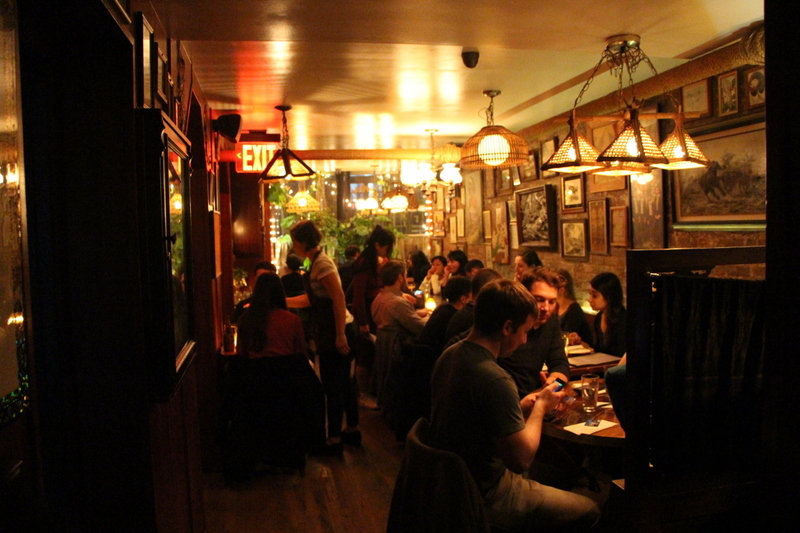 With Thai restaurants in Hell’s Kitchen especially looks can be deceiving. If you want beautiful chandeliers, go to Room Service. For good honest food, go to Pam. Anthony Bourdain’s “Parts Unknown Thailand” with Andy Ricker is one of my favorite food episodes of all time. It was real, it was fun, and it gives you a good size glimpse of what exactly is behind Ricker’s motivation… women! Yes, food and the culture are probably high up there, but its probably the women that made the man move back and forth and back again for 20 years. 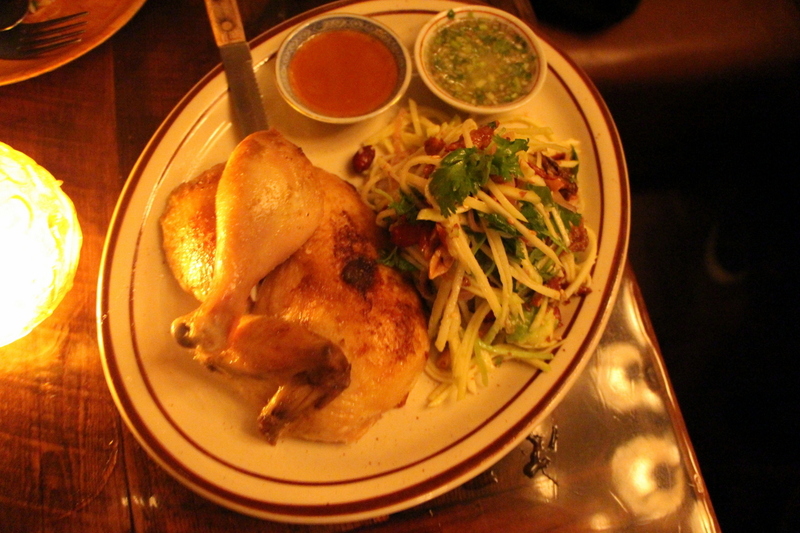 Even some of the servers at Pok Pok NY including the boys were a sharp reminder that you are at a Ricker establishment. I vividly recall one particular moment from that episode where they visit a family run shack somewhere remotely, where Ricker starts flirting with a girl pretty much in front of her parents. Now that is some Chutzpah. 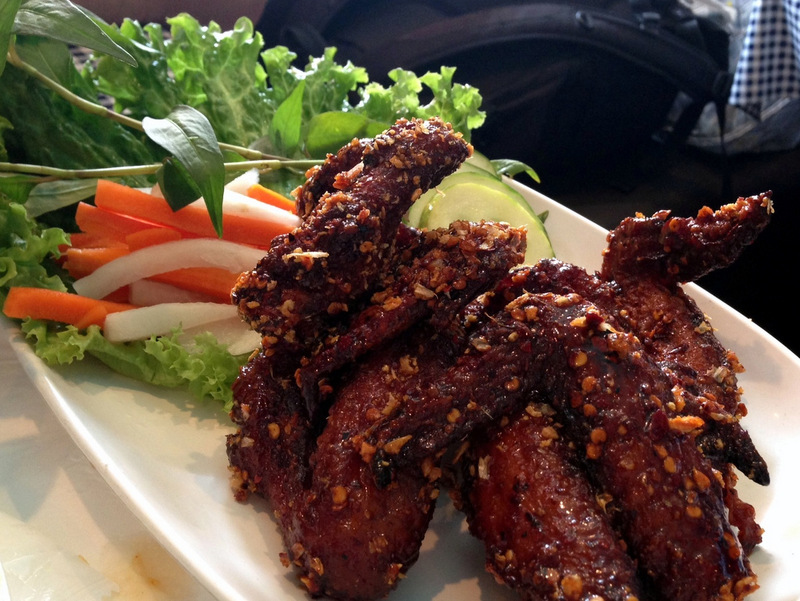 Ike’s Vietnamese Fish Sauce Wings. I don’t know who this Ike guy is but I’m guessing he is a good guy, and an honest citizen, and probably a fantastic cook. These are plus size Amish wings that are seasoned in such a way that you will contemplate not washing hands for a few days. 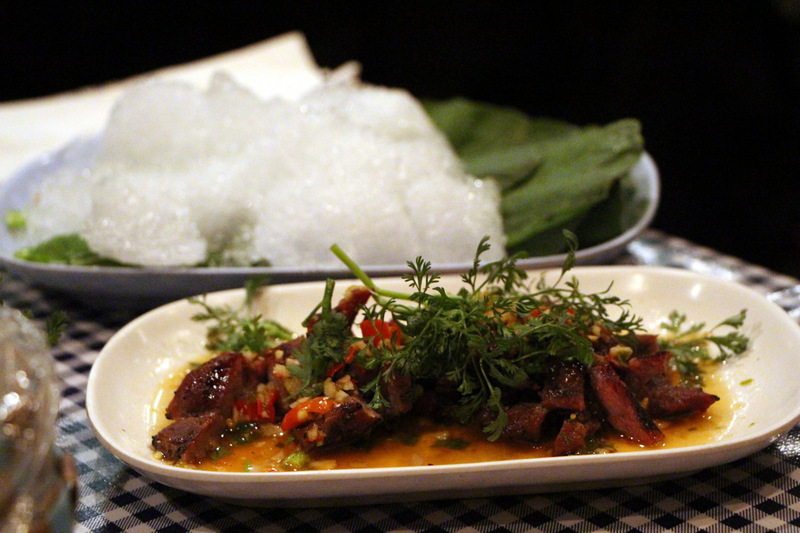 Muu Paa Kham Waan – Boar collar meat rubbed with garlic, coriander root and black pepper, glazed with soy and sugar. 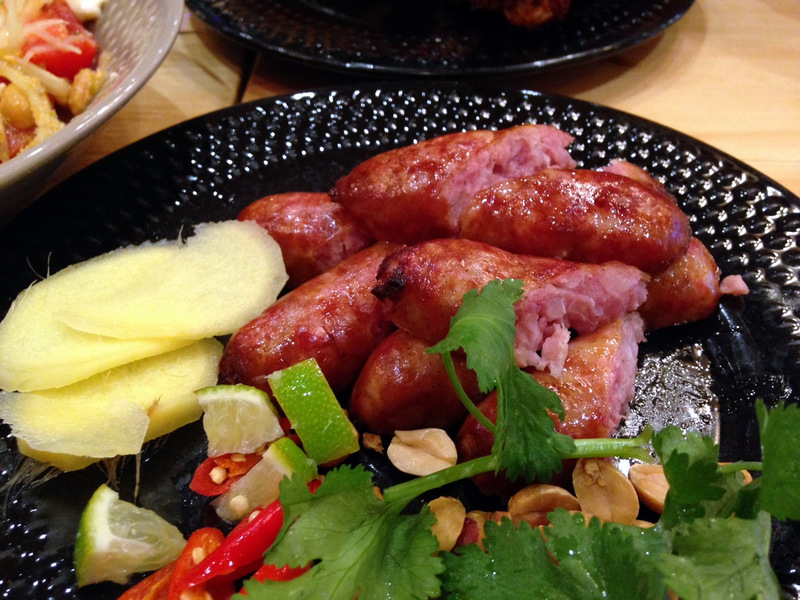 Grilled over charcoal and served with chilled mustard greens and a spicy chili/lime/garlic sauce. Even the slightly overcooked Boar didn’t stop it from being the dish of the night. Its all in the sauce of gods that could even make your car keys eatable. Fantastic dish! Winged Bean Salad – This was a special. 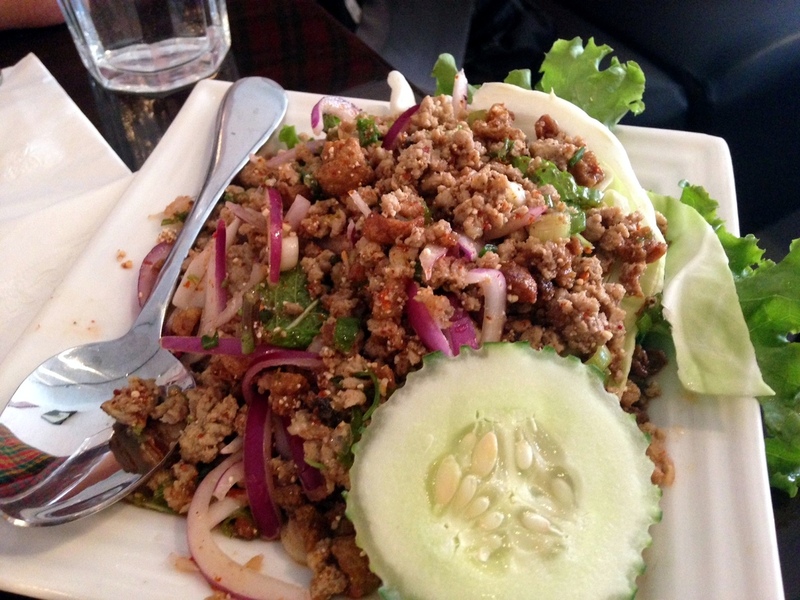 Florida grown crunchy sliced Winged Bean pods mixed with prawns, pork and a hefty amount of Thai Chilies. The spiciest dish of the night by far, and something I would definitely order again. Dessert was as exciting as Thai desserts can get. 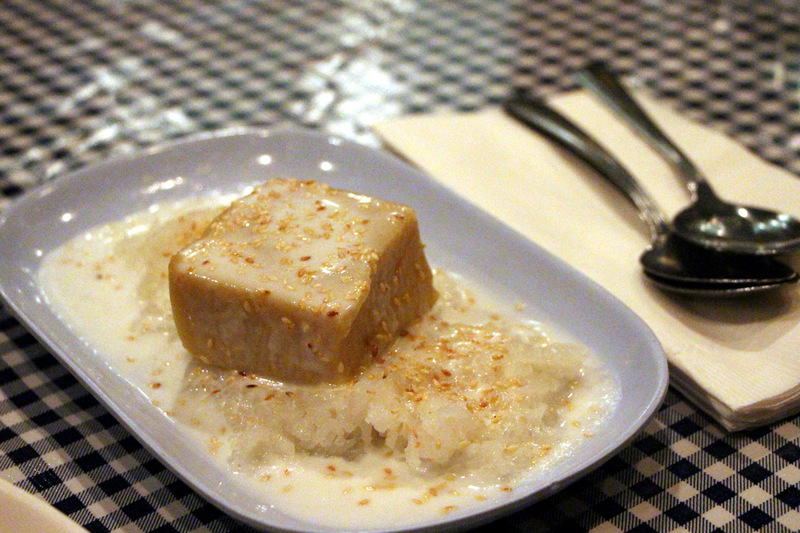 A not so smelly Durian scented creation on sticky rice with coconut milk. Slightly less successful than the similar pumpkin at Pure Thai Cookhouse. 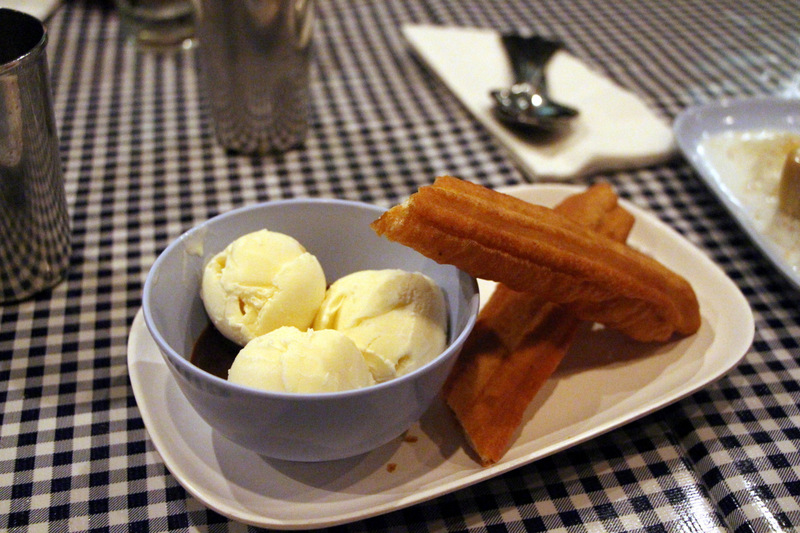 The Affogato was your good basic Affogato but with Churros-like doughnuts. The lone clunker was the ice cream sandwich which didn’t work for any of us.